It’s snowing again in London! For the second time this week, snow is falling in London. This entry was posted in London and tagged England, London, Snow, Weather. Bookmark the permalink. 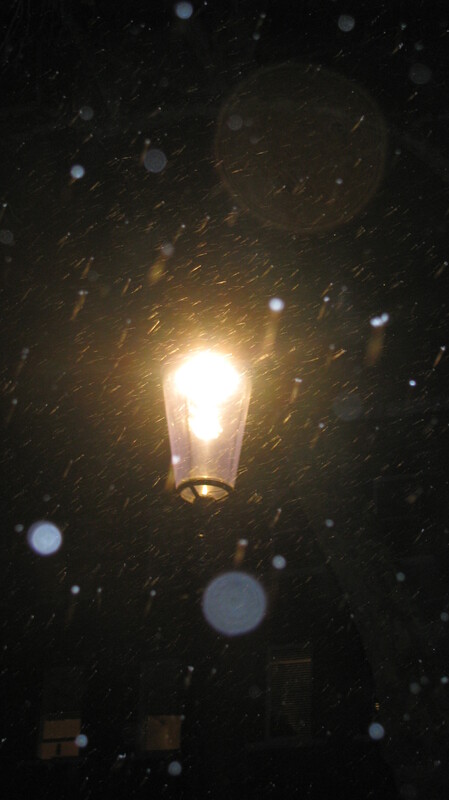 22 Responses to It’s snowing again in London! Very pretty 😀 It snowed here in Philadelphia, USA just yesterday! A week before that, it was so warm we didn’t even have to wear our jackets.. I guess we can both thanks global warming! It has been such a strange winter! Hard to believe that you didn’t have to wear a coat in Philly last week. Weird. By the way, Philadelphia is one of my favorite historical cities. You have been getting a lot of snow. Stay warm and dry! Take care Nia. I am jealous! We had 82 inches last year and hardly an inch this year. No fun! I still can’t get over that you had 82 inches last year and then nothing this year. That is totally crazy! Fortunately for me I do! I really hope this odd weather doesn’t continue to ruin the seasons. Spring is one of my favorites and I’m excited to see all the trees, bushes, and flowers bloom. I hope they will. 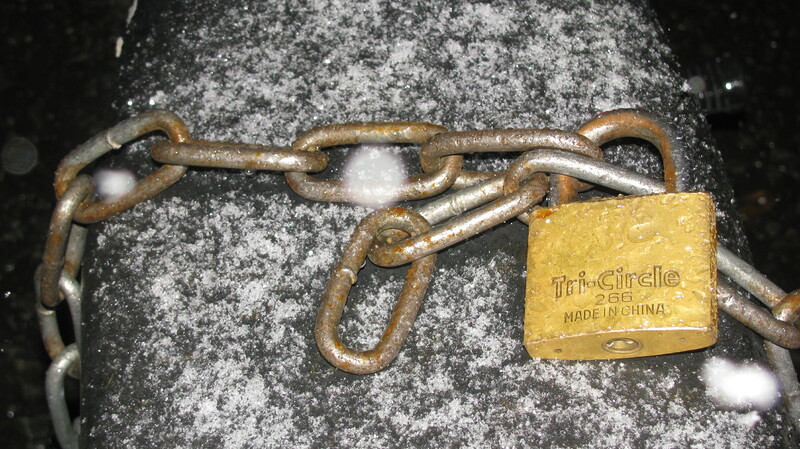 Unusual shots, i like the strength of the lock and chain against the wisps of snow. Thanks. When I have my dog with me it is hard to really get good photos. And when it snows he likes to chase the snowflakes so I only had time for a couple of shots since I thought he would make me drop the camera. Serves me right, it was time for his walk. I saw the chain and lock on someone’s moped and I liked it with the dusting of snow. Artistic and mysterious. It feels like there is a story waiting to be told. I bet you can come up with a great story! I love when that happens! I don’t think it will stay long though. The sun is peeping through the clouds. Chains already have such a heavy look, but with a bit of snow it feels even more so. It does. This lock and chain really caught my eye. Fortunately London is not suffering from the extreme winter that is hitting Eastern Europe. I feel for them out there and I hope everyone is safe and sound and that the weather eases up for them soon.